Tomorrow is my mother’s birthday. Jan Hallett Weisblat (a.k.a. 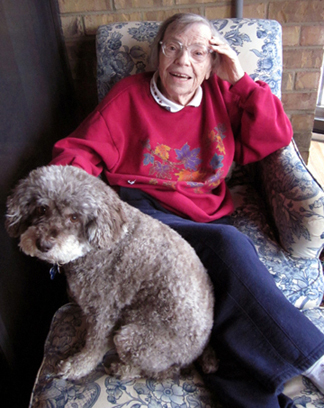 Taffy) would have turned 94 this September 26. So naturally I’m thinking about her. And it’s only a small step from thinking about her to cooking her favorite dishes. Both the thoughts and the food make me smile. 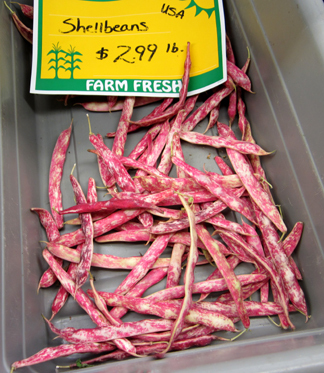 These fresh beans are encased in pink-and-white-mottled skins. When removed from their shells the beans themselves are also white with pink flecks, although they trade those colors for a less exciting uniform beige when cooked. Whenever my mother saw them, she would buy them, take them home, and make succotash. I have a feeling the beans were grown on her grandparents’ farm when she was growing up because they represented home to her. Now they speak of home to me as well. 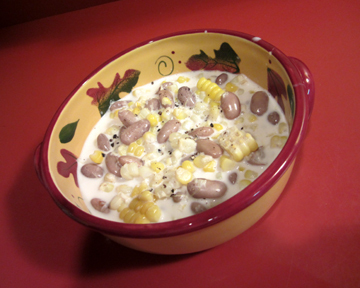 I made pink-bean succotash a couple of weeks ago in Taffy’s memory. She never actually measured the beans or the corn or the cream so the quantities below are approximate. If you want to dress up your succotash, add a little sautéed onion, some herbs, and/or a little bacon garnish. My mother never did so the recipe below is rather plain. Its flavor is far from plain, however. The beans have a subtle but unmistakable nutty taste. When you throw in the corn and the cream (or half and half) and grind a small hill of pepper on top you end up with a dish fit for a queen. The succotash embodies my mother’s ability to take joy in simple, everyday pleasures. If I can be half as joyful in my lifetime, I will count myself lucky. Pick over the beans, removing any that have turned brown. Stir the beans from time to time while they simmer, and be sure to add more water if you need to. At the end of the simmering process the beans should still have a little—but not a lot of—liquid in their pan. Do not drain off this liquid. Stir in corn and cream or half and half to taste. The beans should be in a gentle liquid bath but shouldn’t be drowning. Cook for another 5 minutes or so, until everything is heated through. Grind pepper over the succotash and serve it. Serves 6 to 8 hearty eaters. I have made a variety of pizza crusts over the years. They are generally quite tasty. But they’re generally also a lot of work. I’m just not geared toward stretching things gently. 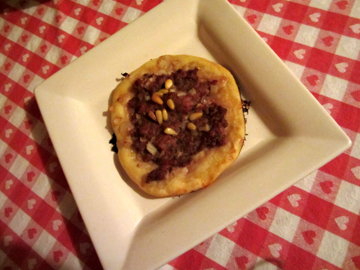 The patties were simple, a mixture of lamb and spices on a basic flatbread. Once I discovered the flatbread, a metaphorical light bulb went off above my head. I realized I could use it as a pizza crust! So last week I made tiny Margherita pizzas using the same dough recipe. They were WONDERFUL … and I had no trouble shaping them! Here is the flatbread recipe, slightly adapted from Thomas’s original. So far I have made 12 or 18 patties with it. I imagine one could also make one large pizza, but I love the tiny version so much (I really get a kick out of miniature food) that I’m not tempted to do that right now. 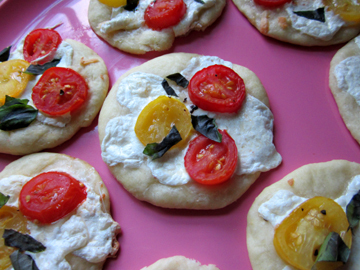 Since we still have tomatoes and basil galore, I’m planning to make another batch of mini-Margheritas soon. I suggest my readers do the same. Here’s my Margherita recipe to use as a guide. Luckily for me, the dough balls do NOT have to be perfect rounds! Begin about 4 hours before you want to bake your pizza/patties. In a small saucepan melt the shortening and the 2 tablespoons butter. Set aside to cool slightly. Combine the yeast with the lukewarm water and let it proof briefly. In a mixing bowl whisk together the flour and salt. Stir in the shortening. Add the yeast to the flour mixture. Mix and knead the dough until it is firm enough to roll. If the dough refuses to hold together, add a small amount of melted butter. Place the dough in a greased mixing bowl, cover it with a damp cloth, and place it in a warm part of the kitchen to rise until it has doubled in bulk (2 to 3 hours). When the dough has risen, preheat the oven to 450 degrees. 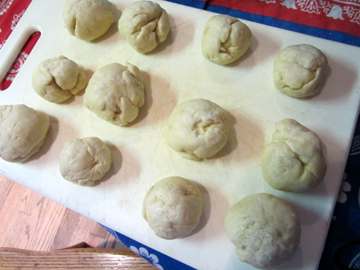 Cut the dough into 12 pieces (or 18), and place the pieces on a cookie sheet covered with a damp cloth. Allow them to stand, covered with a damp cloth, for about 1/2 hour. Use the palm of your hand and your fingers to shape the balls into little flat rounds. They will be between 3 and 4 inches in diameter, depending on how many you are making. Serves 12 to 18 as an appetizer, 4 to 6 as a main course. 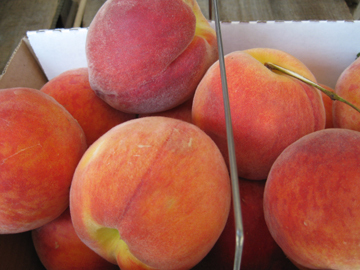 Peach season is winding down in our corner of Massachusetts. I’ll miss it, but apples are on their way! 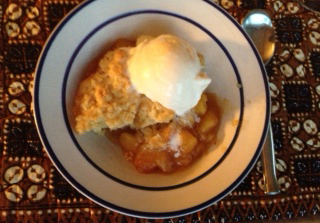 I have made this cobbler a couple of times in the past few weeks with juicy local peaches. Once I used peaches alone (the photo at the top of this post, courtesy of my friend Lisa Johnson); once, half blueberries and half peaches (the photo at the bottom). The dessert is simple to make. It’s even simpler if you make the fruit base the night before and throw things together to bake while you’re eating your main course. If you love ginger with your peaches, substitute a little of it for the cinnamon. Or just add ginger along with the cinnamon. I love ginger but not necessarily in peaches so I left it out. Begin by making the base. Combine the sugar and cornstarch in a smallish nonreactive pot. 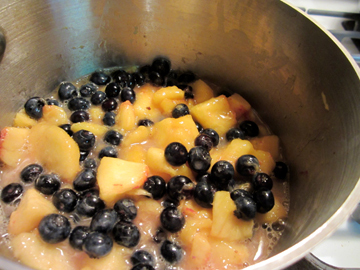 Stir in the fruit and lemon juice. Bring the mixture to a boil, stirring occasionally. Boil, stirring gently, for 1 minute. Remove the fruit from the heat and stir in the cinnamon. Spread the fruit n the prepared pan. Dot the top with butter. Whisk together the milk, egg, and vanilla. Add them to the dry ingredients, and mix just until moist. Drop the resulting mixture onto the peaches, and spread it around to cover the fruit. Sprinkle brown sugar over all in little clumps.